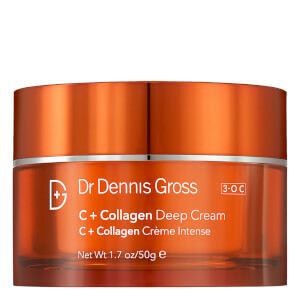 Rediscover your skin's youthful capacity with Dr Dennis Gross Skincare C + Collagen Brighten and Firm Vitamin C Serum, a weightless gel-serum that targets visible signs of ageing to leave the complexion looking smooth and glowing. Melting quickly into skin, the lightweight formula combines the brand's proprietary Vitamin C 3-O C Technology with Collagen Amino Acids and an Energy Complex to instantly brighten and smoothen the appearance of skin. 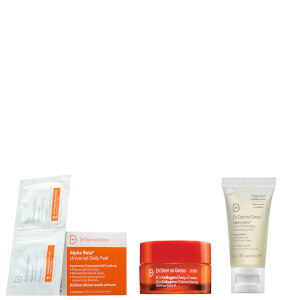 It helps to improve the look of wrinkles whilst alleviating dark spots to promote a more even skin tone. After use, the complexion looks brighter and energised with improved firmness, radiance and texture. Massage 1-2 pumps into clean, dry face, neck and décolleté once daily. Follow with a moisturiser of your choice. Water/Aqua/Eau, Glycerin, 3-O-Ethyl Ascorbic Acid, Niacinamide, Glycereth-7 Triacetate, Lactic Acid, SD Alcohol 40-B, Hydroxyethylcellulose, Dimethyl Isosorbide, Ascorbic Acid, Collagen Amino Acids, Superoxide Dismutase, Glycine, Carnitine HCl, Ubiquinone, Hexylresorcinol, Emblica Officinalis Fruit Extract, Hydrolyzed Soy Protein, Tetrahexyldecyl Ascorbate, Isoquercetin, Mandelic Acid, Pueraria Lobata Root Extract, Curcuma Longa (Turmeric) Root Extract, Phytic Acid, Citric Acid, Tetrasodium EDTA, Sodium Citrate, Butylene Glycol, Xanthan Gum, Polysorbate 20, T-Butyl Alcohol, Sodium Hydroxide, Polysorbate 80, Denatonium Benzoate, Benzyl Alcohol, Phenoxyethanol, Sodium Benzoate, Potassium Sorbate, Caramel.